You may have discovered new career possibilities at an entrepreneurial or lifestyle agency. However, leaving your current agency, losing your book of business, and starting from scratch can be too nerve-racking or seem financially impossible to make the leap. There are options to make the transition from one agency to another a little easier and less frightening. Whether you want to purchase your book of business, take the leap and believe you can recover quickly. Even if you lose your book and decide to use a draw, you can make your dreams a reality. Consider the following options for transitioning to a new agency before you rule out the possibility of a more rewarding position due to fear. Pay for your book over time. If you’ve decided to transition to an agency that pays you higher commissions, such as an entrepreneurial agency, the increased monies will help pay for the purhase of your book during the first years. Once the book is paid off, you are able to reap the full benefits of the new agency model. Many find this happens more quickly than expected. Use a draw to cove expenses. If you are unable to purchase your book, you new agency may provide a draw option until you can build your book up again. This typically covers the duration a noncompete. While this option may not be comfortable, it is important to keep the end goal in mind. It will be worth it. Use statistics as leverage in negotiations. As you work to come to a deal about the cost and potential payment plan for your book of business, negotiate with the agency. Remind them that agencies typically lose 70 percent of a producer’s book on average over a 3-year period when that producer leaves. Although this can be a bit of a risky tactic, it may help them to realize the value in working out an amicable deal. Keep in mind that whatever option you choose, it will require a legal agreement between you and your old firm. We recommend you hire counsel to ensure the transaction progresses smoothly and you have representation in the event something is contested. Making the decision to change direction in your career can be risky, but there is potential for greater income and growth opportunities outside the traditional corporate agency. 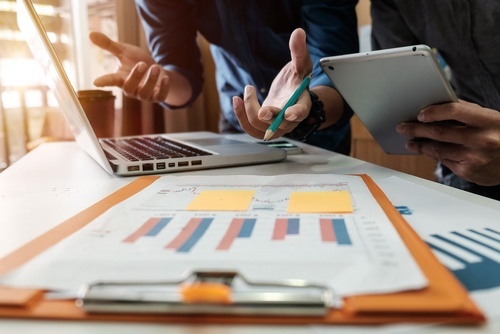 Compared to traditional agencies, entrepreneurial agencies offer an average increase of 30 percent to 40 percent on renewal commissions, as well as an average increase of 10 percent to 20 percent on new business commissions. In addition, entrepreneurial agencies offer their insurance producers equity in their book and stock options in the agency. 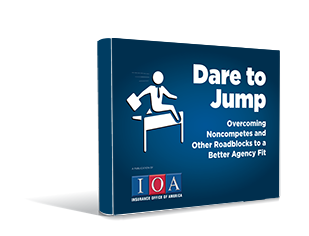 If you’re still unsure if leaving your agency is the right step for your career or you think other roadblocks are impeding your success, read Inforum’s complimentary ebook “Dare to Jump.” Download the ebook now for insights on overcoming noncompetes and other roadblocks to a better agency fit.